(1) Alkanes : An alkane has only carbon carbon single bond. (3) Alkynes: An alkyne has one carbon-carbon triple bond. Cyclic or closed chain hydrocarbons :These compounds contain close chains or rings of carbon atoms in their molecules. Hydrocarbons which contain a ring of three or more carbon atoms and have properties similar to those of aliphatic hydrocarbons are called alicyclic hydrocarbons. (1) Cycloalkanes : Saturated alicyclic hydrocarbons in which all the carbon atoms are joined by single covalent bonds are called cycloalkanes. (2) Cycloalkenes: Unsaturated alicyclic hydrocarbons which contain one carbon carbon double bond are called cycloalkenes. (3) Cycloalkynes: Unsaturated alicyclic hydrocarbons which contain one Carbon Carbon triple bond are called cycloalkynes. (1) Benzenoid aromatic compounds : Hydrocarbons and their alkyl, alkenyl and alkynyl derivatives which contains one or more benzene rings either fused or isolated in their molecules are called benzenoid aromatic hydrocarbons.They are also called arenes. Arenes may also contain two or more isolated or fused benzene rings. (2) Non-benzenoid aromatic compounds: Aromatic Hydrocarbons which do not contain a benzene ring but instead contain other highly unsaturated rings are called non -benzenoid aromatic compounds. The acyclic saturated hydrocarbons are called paraffins since they are relatively unreactive towards most of the reagents such as acids, bases oxidizing and reducing agents. (1) Methane, ethane and propane have only one structure since there is only one way in which 1,2 and 3 carbon atoms can be connected. (2) Pentane has three isomers. (3) Six carbon atoms in hexane can be arranged in 5 different ways. Structural isomers which differ in the arrangement of carbon chain are called chain or nuclear isomers. Alkanes contain carbon – carbon and carbon- hydrogen single bond with average bond lengths of 154 pm and 110 pm. Each carbon in alkanes is sp3 hybridized. Since a sp3 hybridized carbon has four half filled sp3 orbitals, therefore it forms four bonds. These four bonds are directed towards the corners of a regular tetrahedron. The angle between any two adjacent bond is 109°28′ .Thus alkanes have tetrahedral structure. In methane molecule, carbon lies at the corners of the tetrahedron while the four hydrogens are present at the corners or the vertices of the regular tetrahedron. Thus methane has a tetrahedron structure. The process of addition of hydrogen to an unsaturated compounds in presence of a catalyst is called hydrogenation or reduction. Alkenes and alkynes add one and two molecules of hydrogen in presence of a catalyst such as nickel , platinum, palladium to form alkanes. With ordinary nickel, relatively high temperature are required. This hydrogenation of unsaturated hydrocarbons using ordinary nickel at a temperature of about 523-573 K is commonly known as Sabatier and Sendern’s reaction. (a) Through Grignard reagent : Alkyl halide especially bromide and iodide react with magnesium metal in presence of dry ethoxyethane to form alkyl magnesium halides. These are commonly known as Grignard’s reagent. Since carbon is more electronegative than magnesium , therefore, C-Mg bond is quite polar. Hence Grignard’s reagent readily reacts with compounds containing active hydrogen such as acids ,alcohols , ammonia ,amines to form alkanes. (b) Wurtz reaction: When an alkyl halide is treated with metallic sodium in presence of dry diethyl ether , a symmetrical alkane, containing double the number of carbon atoms present in the alkyl group is formed. This reaction is called wurtz reaction. Wurtz reaction is a convenient method for the preparation of symmetrical alkanes i.e. alkanes containing even number of carbon atoms. If two different alkyl halides are used to prepare an alkane with odd number of carbon atoms, a mixture of three alkanes is actually produced. This is due to the reason that the two alkyl halides in addition to reacting with each other also react among themselves giving a mixture of three alkanes. The boiling point of these alkanes are very close and hence they cannot be separated by fractional distillation. It is because of this drawback that Wurtz reaction is used for the synthesis of only symmetrical alkanes and not for the preparation of unsymmetrical alkenes i.e. alkanes containing odd number of carbon atoms. (1) Through intermediate formation of an organometallic compounds. (2) Through intermediate formation of free radical. (c) Corey-House reaction : Corey -House reaction can be used to prepare both symmetrical and unsymmetrical alkanes in good yield. In this reaction ,the alkyl halide is first treated with lithium metal in dry ether to form alkyl lithium which is then allowed to react with cuprous iodide to yield lithium dialkyl copper. Lithium dialkylcopper thus obtained on subsequent treatment with a suitable alkyl halide gives the desired alkane. (d) Reduction of alkyl halides: Alkanes can also be prepared by the reduction of alkyl halides (Bromides and iodides). (1) Reduction by dissolving metals such as Zn and CH3COOH or HCl ;Zn and NaOH or Zn-Cu couple and alcohol. With zinc and an acid or with Zn-Cu couple and C2H5OH reduction occurs by transfer of electrons and not by nascent hydrogen as originally believed. (2) Reduction by chemical reagents such as LiAlH4 , NaBH4 , Ph3SnH. 1° and 2° alkyl halides are readily reduced to alkanes by LiAlH4 but 3° alkyl halides mainly undergo dehydrohalogenation to form alkenes. NaBH4 reduces 2° and 3° alkyl halides but not 1° whereas triphenyltin hydride reduces all the three types of alkyl halides. (3) Catalytic hydrogenation implies cleavage of a sigma bond with H2 in presence of a catalyst. The best catalyst is Pd-C but Ni has also been effective provided it is used in large excess. (4) Reduction with HI and red P : Alkyl halides are readily reduced to the corresponding alkanes by heating with concentrated HI in presence of red P at 423 K.
The purpose of red phosphorus is to remove the iodine liberated in the reaction, otherwise it would react with the alkanes to give back the alkyl iodide. The alkane formed by this method has the same number of carbon atoms as the alkyl halides. The process of removal of molecule of CO2 from inorganic compound is called decarboxylation. When a carboxylic acid is heated with soda lime(NaOH + CaO in the ratio 3:1) at about 630K , a molecule of CO2 is lost and an alkene with one carbon atom less than the carboxylic acid is formed. (1) CaO permits the reaction to be carried out a relatively higher temperature to ensure complete decarboxylation. (2) CaO keeps NaOH dry because it is hygroscopic in nature. Methane is prepared by heating a mixture of sodium acetate and soda lime in a copper tube and the methane produced is collected by the downward displacement of water. If n is the number of carbon atoms in the salt of the carboxylic acid, the alkane formed has 2(n-1) carbon atoms.If n is the number of carbon atoms in the alkyl group, the alkane formed has 2n carbon atoms. The physical properties of alkanes such as boiling point, melting point, density and solubility depend upon the intermolecular forces of attraction. Since alkanes are almost non-polar molecules (because of the covalent nature of C-C and C-H bonds and very little difference of electronegativity between carbon and hydrogen atoms), therefore, these intermolecular forces of attraction are of van der Waals type which mainly depend upon the shape and hence the structure of the molecule. The magnitude of these forces of attraction depend upon the surface area of contact between adjacent molecules. Greater the surface area, stronger are the van der Waals forces of attraction. (1) Boiling points. Amongst the straight chain alkanes, the first four members (C1-C4) are gases, the next thirteen are liquids (C5– C17) and the higher members (C18 onwards) are colourless waxy solids. The boiling points of straight chain alkanes increase fairly regularly with increase in their molecular mass. The difference in boiling points is, however, greater for the lower homologues than for the higher homologues. This regular increase in the boiling points of straight chain alkanes with increase in the carbon content is due to a corresponding increase in the molecular size and hence the surface area of the molecules. As a result, the magnitude of the van der Waals forces of attraction goes up and hence the boiling point increases accordingly. Amongst isomeric alkanes, the branched chain isomer has invariably the lower boiling point than the corresponding n-alkane. This is due to the reason that with branching the shape of the molecule tends to approach that of a sphere. As a result, the surface area of the branched isomer decreases. Due to lesser surface area of these molecules, the van der Waals forces of attraction operating between their molecules become comparatively weaker and hence lesser amount of energy is required to overcome them, As a result, the boiling points of branched chain isomers are lower than those of the corresponding n-alkanes. Greater the branching, lower is the boiling point. The melting point of alkanes also increases with increases in carbon content but the variation is not regular. Alkanes with even number of carbon atoms have higher melting points than those with odd number of carbon atoms. The melting point of a substance depends not only upon the size and shape of the molecules but also upon how closely the molecules are packed in the crystal lattice, But due to sp3 hybridization in alkanes, any two bonds of a carbon atom make an angle of 109°28′ with one another. As a result, in n-alkanes, the carbon atoms are arranged in a zig-zag chain rather than in a straight chain. Therefore, in n-alkanes, containing an even number of carbon atoms, the two terminal methyl groups lie on the opposite sides of the zig-zag chain. In case of n-alkanes having odd number of carbon atoms, the two terminal methyl groups will lie on the same side of the zig-zag chain. Thus, it is clear that n-alkanes with even number of carbon atoms are more symmetrical than those containing odd number of carbon atoms and hence pack closely in the crystal lattice. In other words, van der Waals forces of attraction are much stronger in n-alkanes having even number of carbon atoms than those having odd number of carbon atoms. Therefore, n-alkanes with even number of carbon atoms have much higher melting points than the next lower n-alkane with odd number of carbon atoms. Alkanes which are predominantly non-polar are insoluble in polar solvents such as water, alcohol, etc. but are highly soluble in non-polar solvents such as petroleum ,ether, benzene, carbon tetrachloride, etc. Greases are mixtures of higher alkanes and hence are non-polar and hydrophobic (water repelling) in nature. Similarly, petrol is a mixture of lower alkanes. Thus, both petrol and greases are non-polar. It is because of this reason that petrol is used for dry cleaning of clothes to remove grease stains. (4) Density. The densities of alkanes increase with increase in the molecular masses.All alkanes are lighter than water. Alkanes contain only C-C and C-H σ-bonds. Since these bonds are quite strong, alkanes are the least reactive of all the hydrocarbons. It is because of this relative inertness that alkanes are also called paraffins. A reaction in which a hydrogen atom of a hydrocarbon is replaced by an atom or a group of atoms is called a substitution reaction. Alkanes, because of having only C-C and C-H sigma bonds undergo only substitution reactions. 1. Halogenation of Alkanes: Halogenation of an alkane is carried out by treating it with a suitable halogen in presence of ultraviolet light or by heating the reaction mixture to 520-670 K.
(2) Bromination: Bromine reacts with alkanes in a similar manner but less readily. (3) Iodination: The reaction of iodine with alkanes is reversible because the hydrogen iodide formed as a by-product is a moderate reducing agent and hence reduces iodoalkanes back to alkane. Thus, direct iodination of alkanes cannot be brought about, However, the iodination can be carried out presence of an oxidising agent such as iodic acid (HIO3) or nitric and (HNO3) which oxidises HI to I2 or in presence of mercuric oxide (HgO) which eliminates HI as insoluble Hg. such as AsF3, SbF3, AgF, Hg2F2 etc. Halogenation of alkanes occurs by a free radical mechanism. (a) Chain initiation: When a mixture of CH4 and Cl2, is heated to 520-670 K in dark or is subjected to UV light at room temperature. Cl2 absorbs energy and undergoes homolytic fission producing chlorine free radicals. 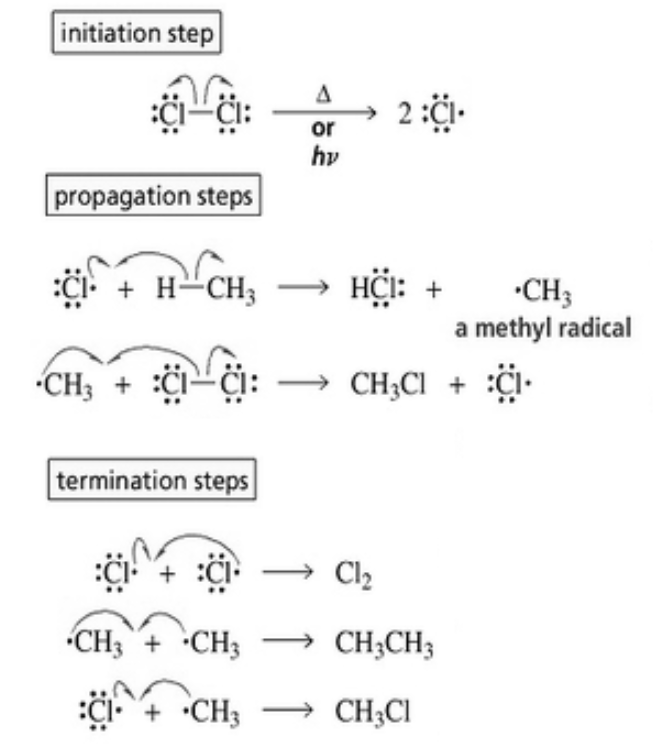 (b) Chain propagation :Each propagation step consist of two reactions. In the first reaction, the •Cl attacks the CH4 molecule and abstracts a hydrogen atom forming •CH3 and a molecule of HCl. In the second reaction, •CH3 thus produced reacts further with a molecule of Cl2 forming a molecule of methyl chloride and another •Cl.The newly formed •Cl reacts with another molecule of CH4 to produce another molecule of HCl and another •CH3. This •CH3 can again repeat reaction.A single photon of light absorbed by Cl2 can bring about the conversion of a large number of CH4 molecules into CH3Cl. Such reactions are called chain reactions. (c) Chain termination: The chain reactions discussed above may come to a halt if two of the same or different free radicals combine amongst themselves without producing few free radicals. The process of replacement of a hydrogen atom by a nitro (NO2) group is called nitration. At ordinary temperatures, alkanes do not react with HNO3. However, when a mixture of an alkane and fuming HNO3 vapours are heated at 423-673K under pressure (vapour phase nitration), alkanes undergo nitration giving a mixture of nitroalkanes resulting through cleavage of carbon – carbon bonds. (3) Sulphonation: Substitution of a hydrogen atom of an atom by sulphonic acid at 675-725. Branched chain and higher normal alkanes undergo sulphonation to give a alkanesulphonic acids. On heating, alkanes readily burn in air or oxygen producing CO2 and H2O. Since the process of combustion is accompanied by liberation of large amount of heat, therefore, alkanes which are the constituents of LPG, gasoline, kerosene oil, diesel are used as fuels. (1) If the combustion of alkanes is carried out in a limited supply of air or oxygen, Co is produced along with unburnt carbon in the form of carbon black or soot. Methane reacts with steam at 1273 K in presence of nickel as catalyst forming a mixture of CO and H2, also called syngas. (1) When a mixture of methane and oxygen at a pressure of 100 atm is passed through a copper tube at 573 K, methanol is formed. (2) When a mixture of methane and oxygen under pressure is passed over heated molybdenum oxide, it is oxidised to methanol. (3) Higher alkanes on oxidation in presence of silver oxide give carboxylic acids. (4) Oxidising agents such as KMnO4 , K2Cr2O7 have no effect on alkanes. When n -alkanes are heated with anhydrous aluminium chloride and hydrogen chloride at 573 K under a pressure of about 35 atm, they are converted into branched chain alkanes. Alkanes containing six to eight carbon atoms when heated to about 773 K under 10-20 atm pressure in the presence of a catalyst consisting of oxides of chromium, vanadium and molybdenum supported over alumina , get converted into aromatic hydrocarbons.This process which involves cyclization, isomerization and dehydration is called aromatization. Decomposition of a compound by application of heat is called pyrolysis. Pyrolysis of higher alkanes to give a mixture of lower alkanes, alkenes is called cracking.It is usually carried out by heating higher alkanes to high temperature under a pressure of 6-7 atm in presence or absence of a catalyst. Pyrolysis of alkanes involves breaking of C-C and C-H bonds and occurs by a free radical mechanism. Preparation of oil gas from kerosene oil and petrol gas from petrol is based upon the process of pyrolysis.For Example: dodecane , a constituent of kerosene oil , on heating to 973 K in the presence of Pt, Pd or Ni , gives a mixture of heptane and pentene along with other products. C12H26 ——-> C7H16 + C5H10 + other products. (1) Methane in form of natural gas is used for running scooters, cars, buses, etc. LPG (mixture of butane and isobutane) is used as a fuel in homes as well as in industry. (2) Methane is used to make carbon black which is used in the manufacture of printing inks, paint and automobile tyres. (3) Catalytic oxidation of alkanes gives alcohols, aldehydes and carboxylic acids. (4) Higher alkanes in form of gasoline, kerosene oil, diesel, lubricating oils and paraffin wax are widely used. (5) Methane is used for the manufacture halogen containing compounds such as CH2Cl2, CHCl3, CCl4, etc, which are used as solvents both in laboratory and industry. Isomers which have the same structural formula but have different relative arrangement of atoms or groups in space are called stereoisomers and the phenomenon is called stereoisomerism. configuration, therefore, stereoisomers have the same molecular structure but different configurations. A sigma (or single covalent) bond between two carbon atoms is formed by overlap of sp3-hybrid orbitals of each carbon along their internuclear axis. Therefore, the electron distribution within the molecular orbital (MO) thus formed is cylindrically symmetrical along the internuclear axis. Due to this cylindrical symmetry of σ-MO’s, rotation about carbon-carbon single bond is almost free (as it requires very little energy for rotation). As a result of this almost free rotation, the molecules of an alkane can have different shapes, ie, different relative arrangements of their atoms in space. The infinite number of momentary arrangements of the atoms in space which result through rotation about a single bond are called conformations or rotational isomers or simply rotamers. In ethane molecule , the two carbon atoms are connected by single covalent bond while the remaining three yalencies of each carbon are satisfied by hydrogen atoms. If one of the methyl groups in ethane molecule is kept fixed and the other is rotated about the C-C bond, a large number of momentary arrangements of the hydrogen atoms on one carbon atom with respect to the hydrogen atoms on the other carbon atom in space are obtained. These infinite number of momentary arrangements of atoms in space represent conformations of ethane. In all these conformations, the basic structure of ethane molecule and various bond angles and bond lengths remain the same. Only two extreme conformations, i.e staggered and eclipsed are important. All other conformations lying in between these two conformation are known as gauche or skew conformations. (1) Sawhorse Formulae: The molecule is viewed slightly from above and from the right and projected on the paper. The bond between the two carbon atoms is drawn diagonally and is slightly elongated for clarity. The lower left hand carbon is considered to be towards the front and the upper right hand carbon towards the back. (2) Newman projection formula: These projection formula are obtained by viewing the molecule along the bond joining the two carbon atom.The carbon atom near the eye is represented by a point and the three atoms or groups attached to it by three equally spaced radii.The carbon atom farther from the eye is designated by a circle and the three atoms or groups attached to it by three equally spaced radial extensions. behind each of the hydrogen atoms on the front carbon. The non-bonded hydrogen atoms are quite close (2.29 A° or 229 pm). As a result, the electron clouds of the σ-bonds of two non-bonded hydrogen atoms repel each other. This raises the energy of the eclipsed conformation relative to staggered conformation. This repulsive interaction between the electron clouds which affects the stability of a conformation is called torsional strain. The magnitude of the torsional strain, however, depends upon the angle of rotation about C-C bond. This angle is also called dihedral angle or torsional angle. Of all the conformations of ethane staggered conformation has the minimum torsional strain and the eclipsed form, the maximum torsional strain. The staggered conformation of ethane is about 12-55 kJ mol more stable than the eclipsed conformation. Thus, it may be inferred that rotation about C-C single bond is not completely free. This energy difference of 12-55 kJ mol-l between the staggered and eclipsed conformations is, in fact, the energy barrier to rotation about the C-C single bond in ethane. However, this energy barrier is not large enough to prevent rotation. Thus, the two conformations are readily interconvertible. As a result, it is not possible to separate the two conformations of ethane However, at any given moment, most of the ethane molecules would exist in the staggered conformation due to its minimum energy and maximum stability.